Hola Amigos! It’s been a few weeks since we wrote, so it seems like about time to post something. 🙂 Life right now is pretty social, meeting new friends and enjoying time with others that we’ve known for, well it must be *weeks* now! A couple of weeks ago, we took a short trip to the other side of Banderas Bay with our new friends Pete & Montse (the machinist and his Mexican girlfriend). 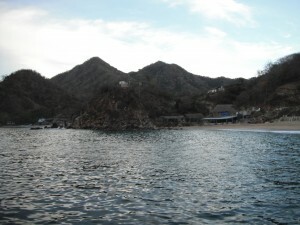 We originally suggested Yelapa, since we’d recently had such a nice time there with Rich & Francine, but Pete suggested that we head further south to a place not in the cruising guidebooks. We ended up visiting a teeny-tiny town named Corales, in a cove that was ever-so-slightly more protected from the prevailing winds and ocean swell than the rest of the coastline in the area. We were nervous moving our big boat in between two rocky points without much information about whether there were any rocks to avoid. So Dan & Pete lowered the dinghy and went closer to shore with a depth sensor and talked with a local pangua driver. He told us where to anchor safely, and we dropped our anchor in 70 feet of water (pretty deep, but with a very steep slope into shore we were confident that we wouldn’t run aground in that direction). Then we set a second anchor from our stern, to keep us from swinging around. We used the dinghy to bring it out to a spot about 15 feet deep and outside the breakers. Although it was pretty rocky, we were secure. We hopped in the dinghy and went ashore for dinner at the one palapa restaurant in town. When they asked what we wanted to eat, there was a bit of a negotiation to decide what was possible. Some of us had breaded pan-fried fish and some had quesadillas – what a nice meal! The next day we dinghied out to a beautiful beach one cove over from Corales. The restaurant owner had told us that there was a nice little fresh-water pond there that we were interested in finding. We didn’t have to look hard! A river ran out to the sea here, except that the sand had somehow formed a dam, forming a pond, but filtering out to sea level. The bottom of the pond was quite silty and got deep very quickly. We decided to explore up-river rather than hang out and go swimming at the pond. We found a trail that criss-crossed through the forest, but ended up circling around the pond. We encountered a few mellow Brahmin cattle along the way. The river was down to a trickle, but the river bed indicated that it gets quite large at times. There were lots of flowering trees and unfamiliar bird calls. We saw high cliffs along one side of the river, and mostly forest on the other. We never saw anyone else on this hike and except for the cattle, there was very little evidence that anyone had ever been here. We meandered up the river bed for a mile or two before turning around. We could have enjoyed hiking for a few more hours but didn’t want to anchor in the dark. We all got a little wet getting the dinghy off the beach, but we’re getting more comfortable with the process. We had a wonderful sail back to La Cruz, and arrived just as the sun was setting – perfect! The next week we took our first “excursion”, where we left our boat for several days while we went inland to see the winter grounds of the monarch butterflies. We moved into the marina first, just to be sure that there would be plenty of people around if something happened. (Of course, nothing did.) We invited Crystal, a new friend to join us on this trip, and had a wonderful time getting to know her better. We left the marina very early in the morning to catch the 6:40 bus from the nearby town of Mezcales to Guadalajara and another from there to Morelia, spending roughly 10 hours seated, but in seats similar to an airline’s business class. There were movies playing on screens every couple of rows, and they even provided a sandwich meal on each leg of the trip. We arrived in the evening and found a cute little hotel within walking distance. No one there spoke English, so the three of us enjoyed the challenge of making our arrangements and finding out how to get a van-bus to the city center for dinner. 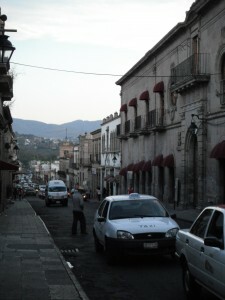 Morelia is an old city, with some beautiful historic buildings around the central park. We enjoyed a short walk and poking our noses into a few of them before searching out a restaurant for a leisurely meal on the square. Finding the correct van-bus to take us back to the hotel was a little bit of a challenge: first we were told bus #1, then bus #3, then back to bus #1. Eventually we found a #1 and the driver confirmed that it would take us to the right place. All of the local buses that we’ve ridden in Mexico seem to be personalized by the driver, leading us to wonder if they own the buses themselves and lease the routes. Many of them have religious images, decorative lighting, and unique signage indicating the destinations on the route. This one had a fancy lighted image on the back wall with moving parts, showing rolling dice and blinking words “Roll the Dice”. There were benches all around the perimeter rather than the usual parallel seating. We found a flyer in the hotel’s lobby, for a local tour guide. We called Lorenzo and made arrangements to go see the butterflies the next morning. 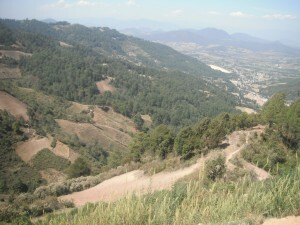 It was a full day, including about 2 hours drive from Morelia to from the reserve. The drive was beautiful, winding around and around through the forest and mountains. We had a beautiful sunny day, which Lorenzo explained was best for seeing the butterflies. He spoke some English, far more than our Spanish, but was appreciative that we wanted to speak as much Spanish as possible. We thoroughly enjoyed our time with Lorenzo, and both Dan and I felt like our ability to interact in Spanish improved notably. We’ve still got a long way to go, but it’s gratifying to see the progress from time to time. The town of Angangueo had many similarities to the town of San Sebastian. Both are nestled in the mountains, had a history of mining but more recently had come to depend on tourism. The architecture was quite similar, including the colors used to paint all of the buildings in town (brilliant white walls with red at the bottom and clay-tiled roofs). There were baskets of flowers decorating many of the windowsills in town. After passing through this town, it was just a short drive – up! We wound back and forth as we headed up the mountain where the butterflies congregate in winter. Lorenzo stopped halfway up for us to get a view of the town down in the valley and the butterflies overhead. Finally we arrived at the reserve’s parking lot, paid our admission and headed up the path. The park is well developed, with thousands of steps marking the way and many benches to the side of the path. 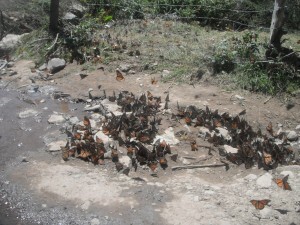 The monarch butterflies have an unusual life-cycle, migrating some 5000 miles from Canada to this one mountain in Mexico. The whole trip spans three generations of butterflies, so each butterfly has encoded in his genes the information for all three legs of the journey. The generation that we saw lives about 8 months, but the other two live only about 8 weeks each. This generation begins around California, heads south for 2 months, overwinters for about 4 months, and then travels north for another 2 months. While in Mexico, they mate (and mate and mate 🙂 ). Each copulation lasts 24-72 hours and depletes all of the resources of the male, who dies when he’s done. The female may mate with 8 or 10 different males. Only the last of these couplings results in the eggs being fertilized, while during the rest, the male is transferring fat to the female, to help her survive the journey ahead. While the pair is mating, the female is immobile and the male does whatever flying is done. It looked like hard work! 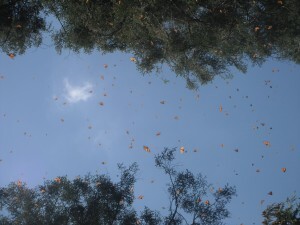 The butterflies congregate in a particular type of pine tree, called an oyamel. When the sun heats up the day, they fly down to the valley and sip on any water they can find in the streams or wherever. The park had set up a slow-dripping hose at the bottom of the trail, to attract a cluster of butterflies. We arrived mid-day, and the butterflies were steadily pouring down the mountain, most above the treetops, but many coming down the trail straight into our faces! We had to walk carefully, so as not to step on any, especially couples that were in flagrante. LOrenzo told us that we could tell the males from the females because the males have a few dark spots on the back of their upper wings, which are sacs of pheromones to attract the females. We walked a large loop, up and then down, marveling at the beauty, quantity and fecundity of the monarch butterflies and their homeland. There were about 18 million of them, although I have to admit that we didn’t count them. They usually leave in early March, in colonies of a few hundred. We timed our visit perfectly! The local schools take a field trip to learn about the butterflies, and we were there on the day that they were visiting. The tour guides and teachers had their hands full, keeping the exuberant pre-teens from flattening too many hapless butterflies under their feet as they ran all around. After our tours, they played hackey-sack or soccer in the parking lot while we watched over a meal in a food-stand. Coincidentally, both our camera and that of our friend Crystal stopped working near the end of our day, so we decided that the universe was telling us to enjoy the rest of the day “in the moment”. On our drive back to the hotel we decided that we were enjoying the trip so much we wanted to take another day. We selected a second tour from Lorenzo’s flyer, and he took us to some beautiful natural sites in the Patzcuaro region the next day. We visited a national park with lots of waterfalls right in the heart of the town of Uruapan and stopped for lunch at a resort on a large, very deep lake named Zirahuen. We bought some unusual sweet-treats, one of which was a whole orange which had been candied and another that was like marzipan only creamier, made from macadamia nuts – yum! We took an overnight bus back to Puerto Vallarta, and then back to La Cruz on the first local bus of the day, just as the sun was rising.